Tower Hamlets Local History Library and Archives is situated in Bancroft Road, Mile End, E1. It was established here shortly after the London Borough of Tower Hamlets was created in 1965, when the former boroughs of Bethnal Green, Poplar and Stepney were amalgamated. The library services of these three boroughs had been collecting local history material since their creation in 1901, meaning that the present collection has been built up for a period of over 100 years. The service restricts its collecting to the area of Tower Hamlets. This generally conforms to the area known as the 'old East End' and includes the 'Jewish East End' areas of Whitechapel, Spitalfields and Stepney. The Library Collections include books and pamphlets, cuttings, illustrations, maps, microforms and audio-visual material. The collection of books and pamphlets is a fantastic resource of the East End for which students, academics and family historians travel from all over the world to consult. 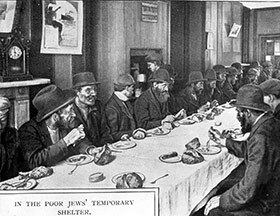 There are good selections of general books about Jewish London and biographies of Jewish East Enders, but of particular interest are publications produced by Jewish organisations and institutions such as; annual reports of the Jews' Temporary Shelter, the Jewish Maternity Hospital and Stepney Jewish Girls Club. The Library houses a good selection of trade directories dating from the late eighteenth century. Gaps in the hard copy run have been filled by obtaining microfilm copies of those from the Guildhall Library. Unlike provincial towns, there are very few street directories listing private residents in the East End. The only examples date from the 1860s and cover the more middle class, northern districts of the borough. There is an almost unbroken run of electoral registers dating from 1901 to the present day. These are now, probably, our most heavily used resource by family historians and many are now available online at Ancestry Library Edition. The cuttings collection is a treasure trove. Culled from a wide variety of local and national sources, it dates back to the early years of the twentieth century. It is arranged by subject, and so, in addition to general cuttings relating to the Jewish East End, there are also files of cuttings on Jewish clubs and societies, re synagogues. The Library has a fine collection of maps. Bordering the City of London, as the borough does, means there are maps covering the city fringe areas of Spitalfields and Whitechapel at a large scale from the seventeenth century onwards. Of particular use to family historians are the large scale Ordnance Survey maps at a scale of five feet to one mile; the first edition of which dates from c.1870. The face of Tower Hamlets has changed beyond recognition in the past 60 years. These maps and other sources can usually aid you to track down the location of the smallest alley or court where your ancestor may have lived as well as the locations of businesses, schools and institutions. The Library also contains a collection of over 35,000 images, mainly photographs. While a proportion dates from the nineteenth century and earlier, the vast majority date from the twentieth century. The pictures are arranged in two sequences; one by street and the other by subject. Of course, only a fraction of residential streets that once existed are represented in the collection. Many were simply not photographed prior to their destruction, or if they were, the photographs have not found their way here, yet! Ironically, perhaps it is the worst sort of housing that is best represented in the collection. 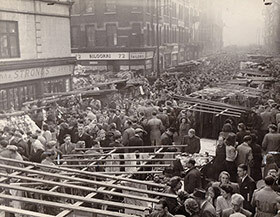 Prior to large-scale slum clearances, borough photographers would go around capturing images of the streets to be demolished. In the sequence arranged by subject, one will find pictures of synagogues and Jewish institutions along with the activities of Jewish clubs and societies. A good range of local newspapers are held on microfilm. The earliest is the East London Observer, which began in 1857. By the end of the nineteenth century, there were about half a dozen local newspapers. These papers are not indexed and, except for persons of exceptional note, there are no notices of births, marriages and deaths: the district being too poor and densely populated to make this viable. If your ancestor died in a manner which necessitated an inquest, there is a chance this will have been reported. The more curious the circumstances of death, the more likely it is to have been reported. 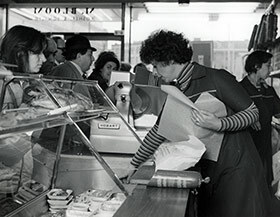 However, if you want to get a flavour of what it was like to live in the Jewish East End, there can be no better way than browsing the local newspaper. The East London Observer even carried a weekly feature called 'News from the Ghetto'. The Library also holds microfilm copies of the Jewish Chronicle from 1841 onwards and a run of Jewish Year Books from 1898. Perhaps, surprisingly, there are few archives of Jewish organisations held. More are to be found at the London Metropolitan Archives. The main Jewish records held are those of the Brady Clubs and of the Princelet Street Synagogue. The Brady Clubs were the Jewish youth clubs originally based in Whitechapel. Their records include membership records from the 1940s to the 1960s, records relating to camps and photograph albums of club activities. The records of the Princelet Street Synagogue include; marriage records and membership records as well as records of the Loyal United Friends Friendly, or Benefit, Society and the Society for Chanting Psalms and Visiting the Sick. View the freely available, digitised marriage register for 1897 - 1907. Perhaps the most significant body of records relating to the Jewish East End are the records of the Stepney Borough Council. This local authority was created in 1901 and survived until 1965 when the London Borough of Tower Hamlets took over. The Jewish East End was largely within the boundaries of the Borough of Stepney. Committee minutes might not be thought of as a very profitable source for family history, but take the minutes of the Markets Committee for example. These record market details of market traders' pitches and we can find that in 1928s Middlesex Street, the first stall outside the Essex Tavern, nine feet long, was occupied by Mordecai Hart of 7 Crispin Street. He sold confectionary and mineral waters and had been in the same position for 35 years. From the Housing Committee Minutes of October 1921: among details of applicants for the council's newly built Jubilee Mansions, we find that Abraham Goldman's family of five at 45 Gower's Walk, Whitechapel, were living in two rooms. He also worked in Hackney. 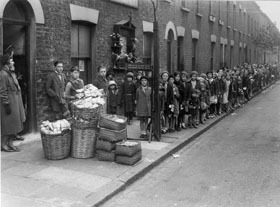 They "removed from 19 Maryland Street, Mile End Old Town, which is at the back of Jubilee Street when houses in Latter Street were demolished through air raid, on account of nervousness of wife and because windows of house were broken". Or we can learn from the minutes of the Maternity and Child Welfare Committee that: in December 1926, the Chicofsky family of 79 Jubilee Street, a family of nine, had an income of five shillings and two pence per head after deducting rent. We also learn that they were succesful in their application to the council's scheme for Free Milk, with an allowance of two pints of milk per day. The council's staff registers contain detailed information relating to employees, many of whom were Jewish. So we can learn for example that: Morris Aaronovitch of 523 Commercial Road, born on 1 April 1905, was appointed on 12 October 1925 to the post of Second Despatch Clerk in the Electricity Supply Section of the Borough Treasurer's Department, on a salary of £100 including bonus. He had obtained a Royal Society of Arts certificate for Shorthand in 1920 - 60 words per minute, and that he resigned his position in October 1929. Sadly, not so many rate books and valuation lists have survived for the Borough of Stepney compared to those for Bethnal Green and Poplar. There are valuation lists for 1910 and 1935. Arranged by address, these give the names of the occupiers, owners and property as well as details of the property's value. Most local school records, including those of the Jews' Free School, are held at the London Metropolitan Archives. However, a growing number have deposited their records at the Local History Library and Archives. These include the records of the Central Foundation Girls' School, now in Bow Road but formerly in Spital Square. 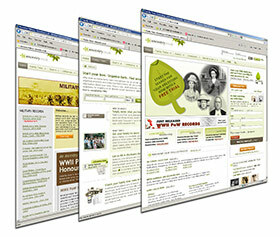 The admission registers covering the periods of 1888 - 1907 and 1932 - 1945, include details of a great many Jewish pupils. There are some wonderful photograph albums too but, sadly, none are captioned with the girls' names. The Archive Collections include several thousand title deeds. Most of these have been indexed by surname. The index is currently only accessible as a huge card index in the reading room. Taking a random entry, we can find out for example that: in 1870, Barnet Solomon Cohen of 9 Magdalen Row, Whitechapel, was leasing out 89 - 91 Mansell Street, Whitechapel.